"Comprehensive medical care for newborns through college." 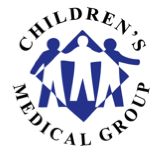 Welcome to Children’s Medical Group website. We are a group of board certified pediatricians located on the East Side of Providence. We provide comprehensive and thorough pediatric and adolescent care, utilizing our affiliations with Hasbro Children's Hospital, Women and Infants Hospital and Brown University School of Medicine for sub-specialty consultation. Children's Medical Group is staffed and equipped to see all our patients so please continue to use the office phone: 401-633-1100 as always. Our hours remain the same, as does after hours coverage for emergencies. All records remain with us and there is no interruption in patient care. We apologize if this news causes any concern or confusion but please be assured that it is business as usual.